What Do The Fans Sing? The ground has improved greatly with the re-development of three sides of the ground during the 1990's. 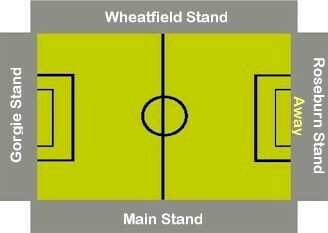 The Roseburn, Gorgie & Wheatfield Stands, are all good sized single tiered stands, that are similar in design and height. Only the Main Stand on one side of the pitch, remains of the 'old' Tynecastle. Originally completed just after the First World War, it looks somewhat out of place amongst its shiny new neighbours. It is two tiered, smaller than the other stands and has a fair few supporting pillars. On top of this stand perches a model of an owl, which is there to help deter the presence of other birds to the ground. The Club have announced ambitious plans to re-develop the Main Stand side of the ground. The �51m development will not only see a new 10,000 capacity stand being built, but new dressing rooms, media & conference facilities. In addition a hotel is to be built on the site, as well as a conference and exhibition hall, offices, gymnasium and some residential apartments. The new stand will be two tiered and will also include 26 executive boxes. The upper tier will be semi circular in design, similar in to existing stands at Wembley and the City of Manchester Stadium, although on a much smaller scale. The Club hope to commence work on the project in the Summer of 2008 with the new stand ready for the start of the 2010/11 season. 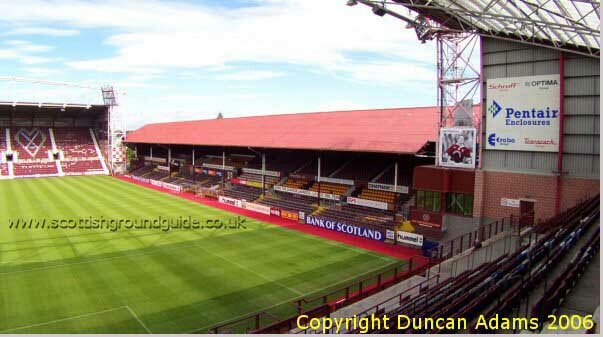 The stand will boost the capacity of Tynecastle to 23,000. 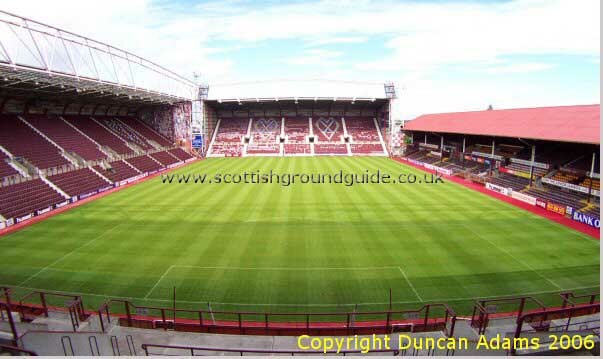 For artistic images of the new proposed stand visit the official Hearts website. Away fans are housed in the Roseburn Stand at one end of the ground, where up to 3,676 supporters can be accommodated. Clubs with a small following may find that a smaller portion of this stand is allocated. The steep slope of the stand ensures a good view of the pitch and the facilities on offer are good. Apart from the Old Firm games and local derbies against Hibs, the atmosphere can be lacking. George continues; 'Any neutral visitors should of course visit the legendary Athletic Arms (see below). Other notable bars include the Tynecastle Arms, which is only a corner kick away from the ground and among the memorabilia on display is the Jersey worn by Super Wayne Foster when he scored the winning goal Against Hibs in a cup tie a few years ago. For some more football Memorabilia John Robertson�s bar is also worth a visit. Both these bars are located In Gorgie Road and get very busy on match days, so get there early'. My favourite pub near to the ground is the Athletic Arms. The pub, nicknamed 'Diggers' as it overlooks a graveyard, serves great beer and has great service. In fact it not unusual to see fans just ordering with their fingers, as when you just indicate, two, three, four, the barman knows that you just want their excellent ale. Follow the M8 towards Edinburgh. At the end of the M8 take the A720 (Edinburgh By Pass) southwards towards Dalkeith. Leave the A720 at the junction with the A71 and follow the A71 into Edinburgh. You will eventually reach the ground on your left. Street parking. The nearest train station is Edinburgh Haymarket, which is a around a 15 minute walk away from the ground. You can see the ground as you come into the station. On leaving the station turn right at the Ryries pub, into Dalry Road. Dalry Road runs into Gorgie Road. About one mile on and the ground is visible from the first major road junction/set of traffic lights. Category A games: Celtic, Rangers & Hibernian. Concessions apply to Under 18's, over 65's and students in full time education. No Idle Talk Fanzine �1. ATB (Always the Bridesmaid) Fanzine �1. For the Hearts fixture list click here (to take you to the BBC Sports Website). A number of wheelchair spaces are available along the walkways of the Gorgie, Roseburn & Wheatfield Stands. These also include provision for one helper per wheelchair space. Disabled fans are admitted free, although helpers are required to pay (Category A Matches �15, other matches �10). Access to these stands is via lifts situated in the Gorgie & Roseburn Stands. A limited number of seats for ambulant supporters are made available in the Main Stand which cost �15 for Category matches and �10 for other matches. 53,396 v Glasgow Rangers, February 13th 1932. If you require hotel accommodation in the area then first try a hotel booking service provided by Football Hotels who are powered by Activehotels, who specialise in locating accommodation near or within a short travelling distance of the football ground. They also have the added advantage over some other hotel booking services that you pay on departure. Yes this site will earn a small commission if you book through them, but it will go to help with the running costs of keeping the Guide going. To access their Edinburgh page click here.